Huntington Beach and Anjo celebrate 35 years of goodwill exchange. 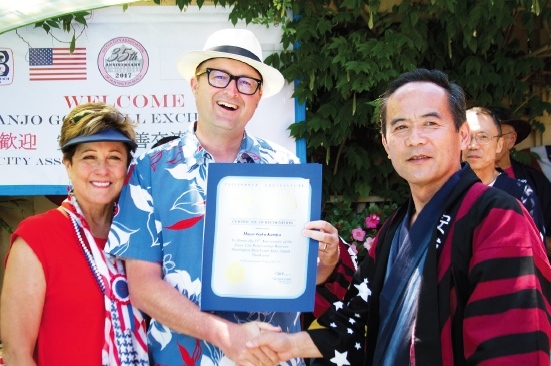 HUNTINGTON BEACH — Red, white and blue were the colors of the day as Huntington Beach celebrated the 35th anniversary of its sister-city relationship with Anjo, Aichi Prefecture, on the 4th of July. A reception was held featuring an “all-American” hot dog barbecue with pork and beans, potato salad and brownies. Special guests included Anjo Mayor Gaku Kamiya, Huntington Beach Mayor Barbara Delgleize, and both adult and student delegates from Anjo. Tomoka Shimada and the other students put their skills to the test by telling jokes in English. 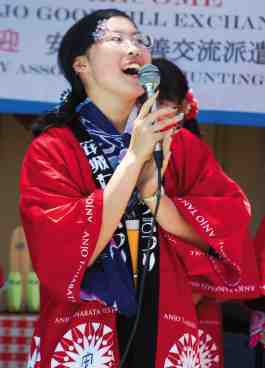 The Huntington Beach Sister City Association has been involved in a variety of capacities, including the selection of assistant English teachers to teach in Japan, and exchanges of art and music. Huntington Beach sent the 40-member Edison High School baseball team to Anjo last year for the Goodwill Games. Annually, four high school students and a chaperone have participated in a two-week reciprocal exchange with students in Anjo. Cultural and fun activities are enjoyed, a number of lifetime friendships have been formed, and the experience has made a dramatic impact on many students’ lives. The Huntington Beach Cherry Blossom Festival was started five years ago to raise funds for this exchange. The 2017 exchange students from Anjo — Yuan Ando, Serina Fukatsu, Tomoka Shimada and Sakura Wakabayashi — opened the reception with each telling a joke in English. Their chaperone was Miki Go, a junior high school teacher. Assemblymember Matthew Harper presents a certificate of recognition to Anjo City Council Vice Chairman Mamoru Nimura. At left is Huntington Beach Mayor Barbara Delgleize. 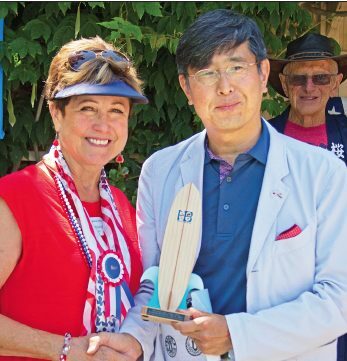 Huntington Beach Mayor Barbara Delgleize with Consul General Akira Chiba. Doug Erber, president of the Japan America Society of Southern California​, was emcee of the day. 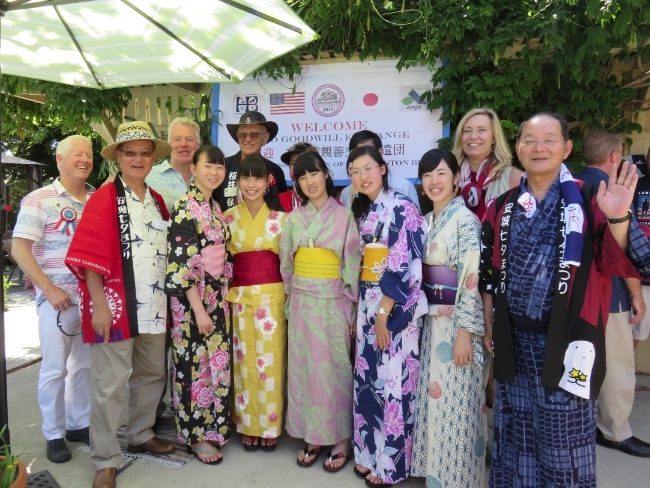 Don MacAllister, vice president of the Huntington Beach Sister City Association and host, welcomed all guests from the local community and Japan. There were congratulatory remarks and gift exchanges from Mayors Kamiya and Delgleize, Mamoru Nimura, vice chair of the Anjo City Council, and Assemblymember Matthew Harper of the 74th District. Michelle Steel, chair of the Orange County Board of Supervisors, gave remarks and presented a certificate of recognition​ to Anjo delegates. Akira Chiba, consul general of Japan in Los Angeles, congratulated the association for promoting U.S.-Japan friendship. Frank Nakabayashi, president of the Sister City Association of Huntington Beach, concluded the ceremony with words of appreciation. Also present were Huntington Beach City Council members Lyn Semeta, Bill O’Conner, and Patrick Brenden​. Emcee Doug Erber introduces the exchange students and their chaperone. 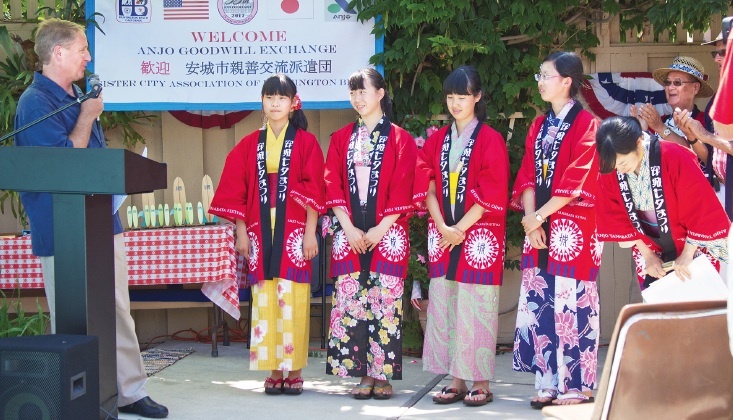 In the 35 years of the sister city relationship, over 180 students and chaperones have been sent from Huntington Beach to Anjo, and an equal number of student and chaperones have visited from Japan. Over 300 adults have exchanged visits between two cities, as well, and 32 members of the Huntington Beach delegation, led by Delgleize, will be visiting Anjo in October. 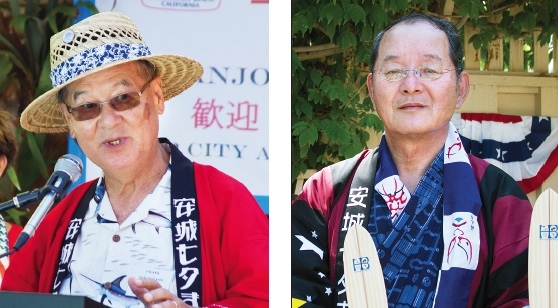 Huntington Beach Sister City Association President Frank Nakabayashi and Anjo Mayor Gaku Kamiya.